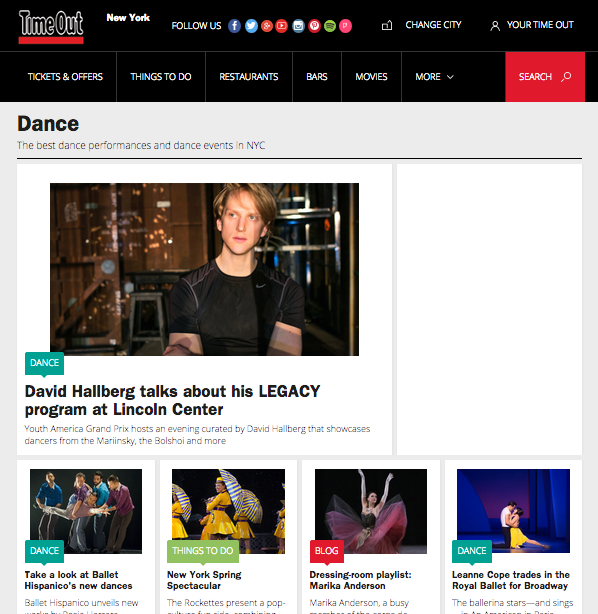 The title page of Time Out New York’s online Dance section as of 4/18/15. Yesterday morning, the news broke that after May 1, 2015, Time Out New York will no longer publish a standalone Dance section in its weekly magazine. Instead, dance coverage will be greatly reduced and integrated into a new Theater and Dance section. This change coincides with the resignation of TONY’s Dance Editor Gia Kourlas; a replacement for Ms. Kourlas, if there is to be one, has not yet been named. This news strikes a large blow to the visibility of the dance community – in addition to the individual readership of TONY, the magazine is delivered to office buildings, doctors’ waiting rooms, coffee shops and hair salons around the city. People trusts its “Critic’s Picks” when deciding how best to spend their money on entertainment. During her tenure, Ms. Kourlas has done an excellent job of featuring dancers from all corners of the field in the magazine, making sure their art receives the same coverage as a new restaurant opening or a sample sale. Now, many fear that dance events will be simply lost in the sea of listings. Write a letter to the magazine telling them how essential dance is to New York City cultural life, and how important — and trusted — TONY’s coverage of dance has been. If you’re a producer, ask the magazine why you should continue to advertise in a publication that doesn’t respect dance on par with other art forms. If you’re an artist, explain how crucial these features were in building an audience and support for your work. Send letters ASAP to the following individuals: Editor-in-Chief Terri White <terri.white@timeout.com>, Deputy Editor Carla Sosenko <carla.sosenko@timeout.com>, and Managing Editor Ethan LaCroix <ethan.lacroix@timeout.com> with a CC to letters@timeoutny.com. As you can imagine, I was very upset by this news. I started my website because I felt there was (and still is) a dearth of informative and critical coverage of dance and performance art in New York City and beyond. Now, it seems like that need has grown even more. For that reason, I’ve decided to restart my “What To See This Weekend” series, as well as add a complimentary “Coming Soon To A Theater Near You” series. “What To See This Weekend” will be published early in the week (Monday or Tuesday), and will list events happening that coming weekend. The “Coming Soon” section will feature performances that are still more than a week away, and, if possible, will feature a preview of one upcoming performance. In the past, I had listed performances that I was interested in seeing, but I’ll be the first to admit that I don’t know everything that is happening in this city’s great and varied dance community. If you know of an event that you’d like me to look into, please make your suggestion through my submission form, or by emailing me at katherine.m.bergstrom@gmail.com. I know that whatever I can do on Point of Contact is far from what Gia Kourlas has done for dance (and what she will, I’m sure, continue to do), but I hope that my website can provide some means of expanding the presence of dance, both on our computer screens and on our agendas. As always, your suggestions for how I can improve Point of Contact to make it a useful tool for learning about dance and performance art are always welcome. You are welcome to leave your thoughts in the comments sections, tweet at me, or email me directly. I look forward to hearing from you.